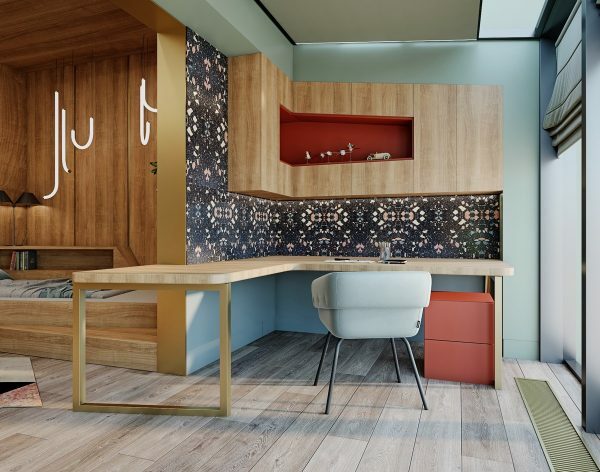 Home offices are as much a part of the modern home as formal dining rooms these days – in fact, many of us repurpose underused dining areas as workspaces! 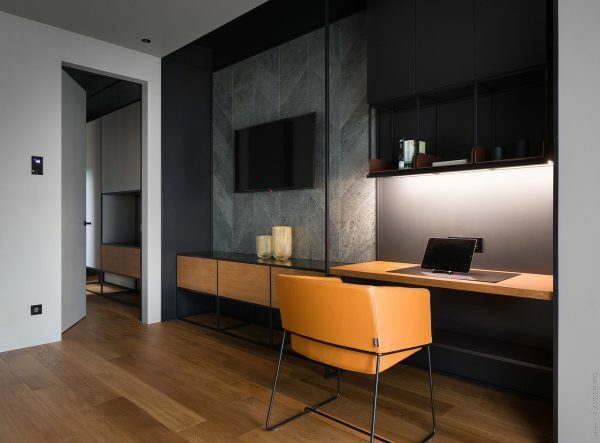 A home office can be set up within almost any room. 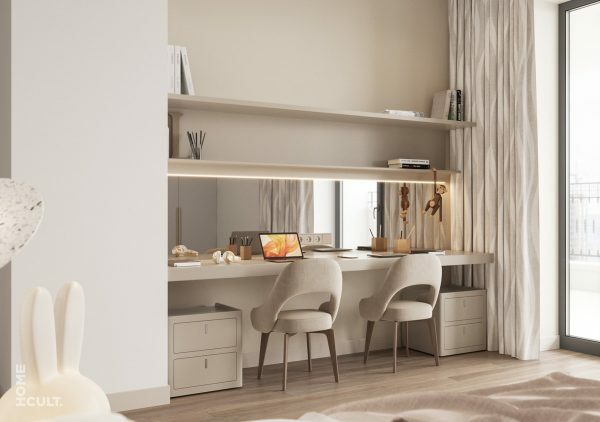 Small study areas in bedrooms are commonplace, double workspaces pop up in living rooms to accommodate demand, and even the kitchen often has more than one kind of ‘worktop’. 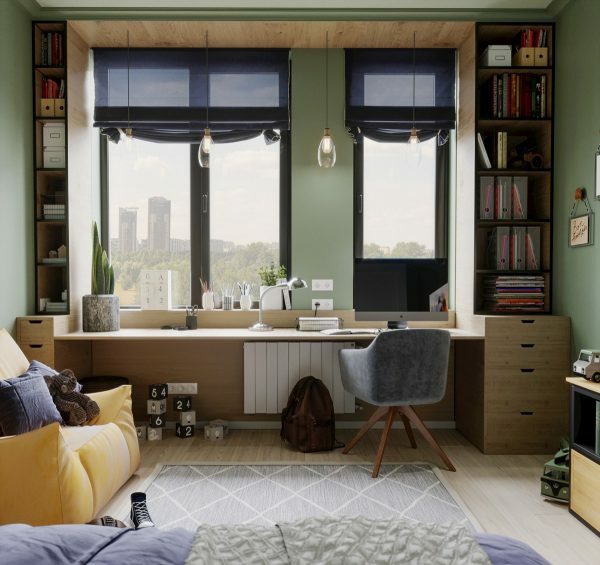 Once you’ve found a good spot, what about the colour scheme, desk design, chair style, shelving needs, and storage furniture to keep the whole thing neat and tidy enough to live with full time? 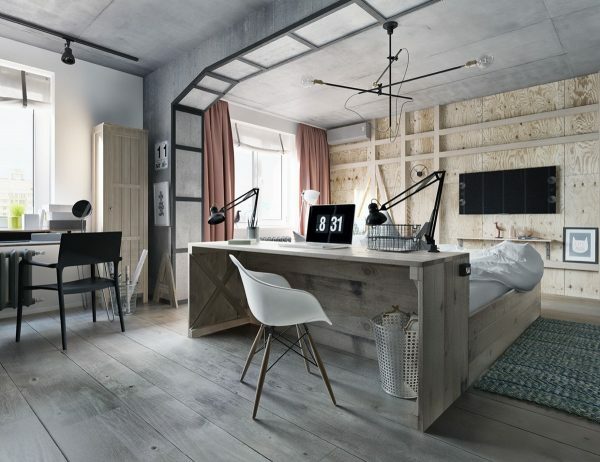 Here are 51 of our favourite workspace designs to get you started. Invigorate your working mind with a bright and welcoming colour. 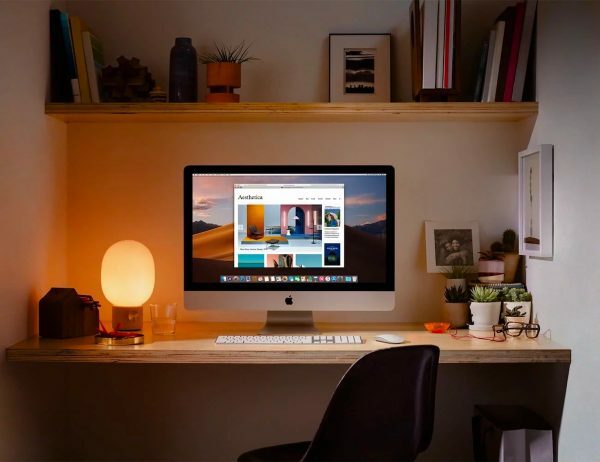 If you want your workspace to be inviting (and we all no that feeling of being repelled by a boring looking desk) then lay out the welcome mat, so to speak. Whack on a welcoming colour like this bright sunshine yellow to chase away a Monday morning feeling of gloom. 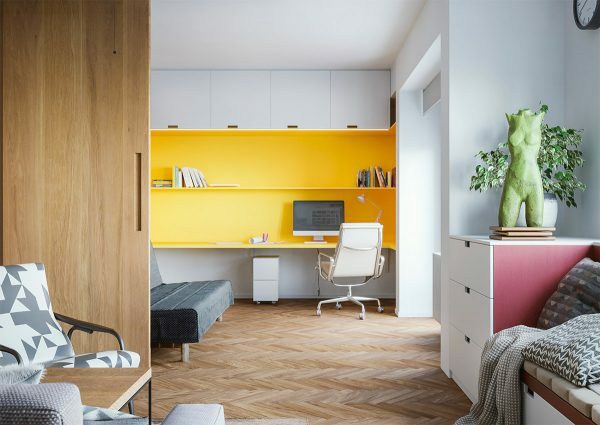 Carve out a section of your room using colour coordination. 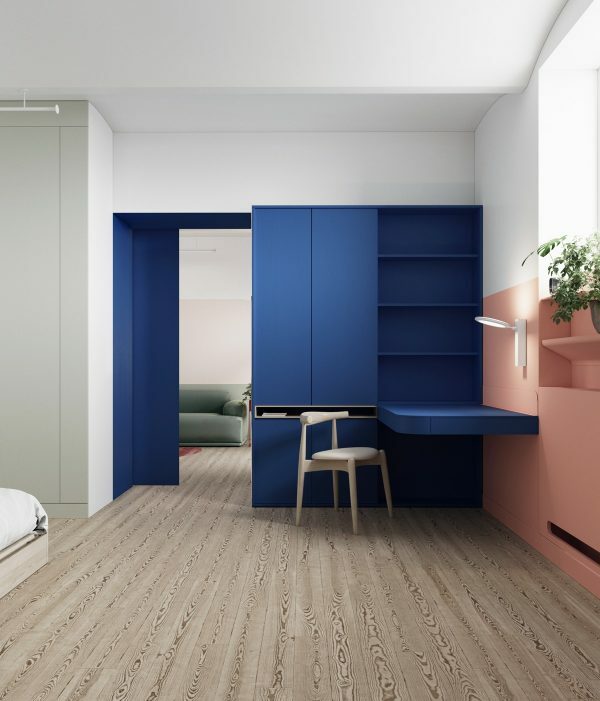 In this bedroom, a storage cupboard, shelving unit, desk and wall paint are colour matched to define a royal blue home workspace. 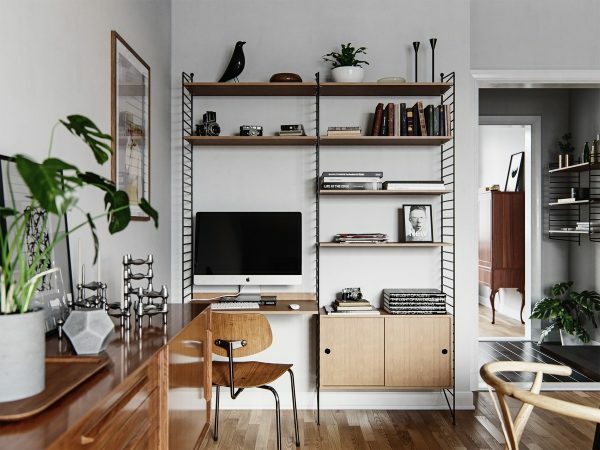 One thin wood trim around a shelf cubby complements the Scandinavian style chair, which is the Hans Wegner Elbow chair. 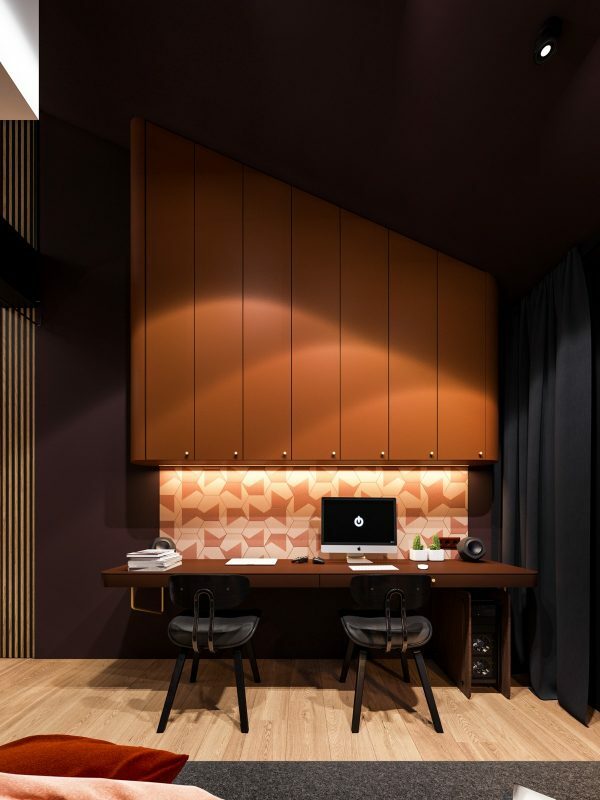 Define the workspace with a wood wall panel. 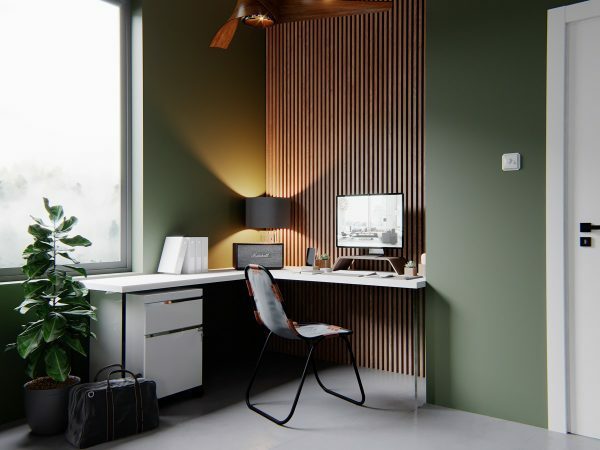 This wood slat wall panel provides a textured backdrop behind a white desk, and the natural tone works beautifully with the sage green room decor. Reap the rewards of repositional small shelves by installing a pegboard. 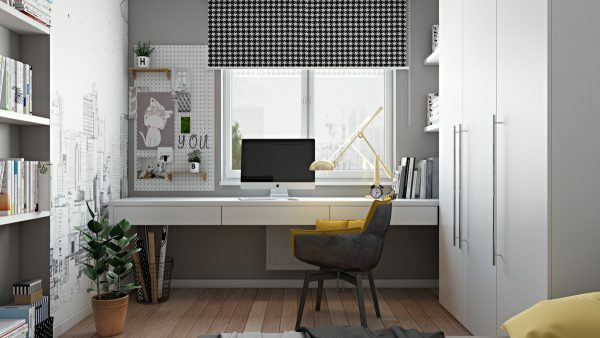 The pegboard trend can be utilised in plenty of areas in the home, but is particularly useful in a busy workspace with changing needs. Screen off noise without blocking off the visual. If you don’t like the idea of being holed away from family life when in the home office, then how about a glass dividing wall? Screen out excess noise and even cooking smells (if that’s your work domain) but remain part of the action. 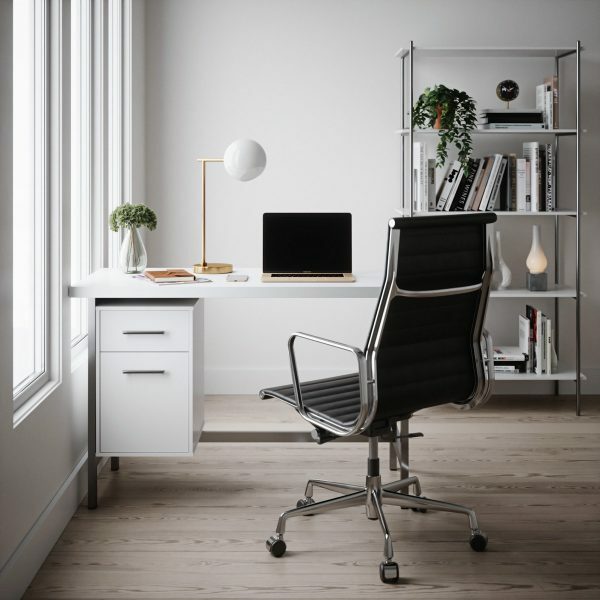 White decor, a minimalist desk and a slender led desk lamp keeps the work stuff paled into the background. Factor in sound proofing. 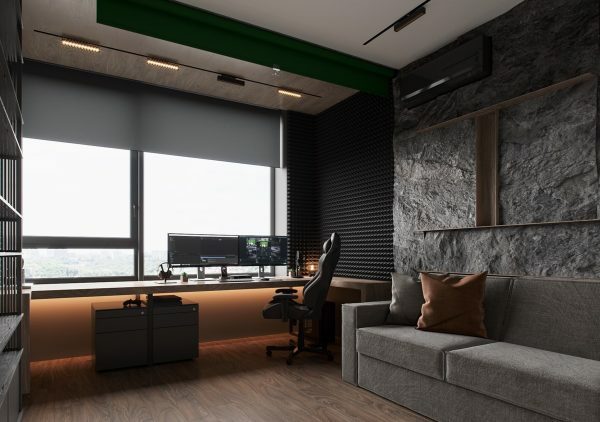 This workspace of a blogger features acoustic wall panels. Whether it’s to keep house noise out, or office noise in, think ahead and make it part of the decor. 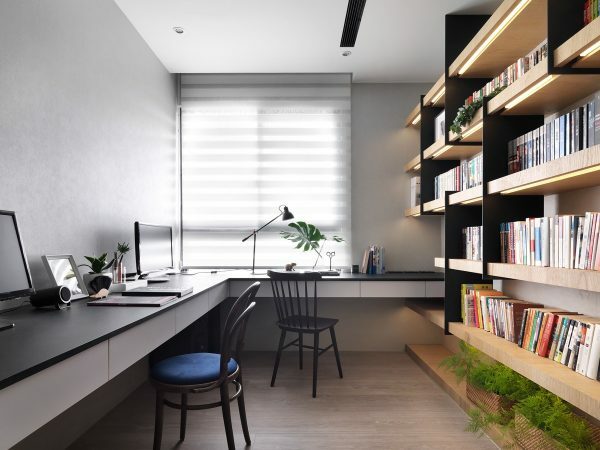 Use office storage furniture to shape the room layout. 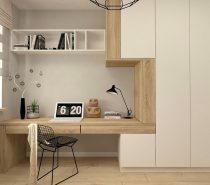 This arrangement of low cabinetry splits the room into a work area and a lounge. Work with what you’ve got. 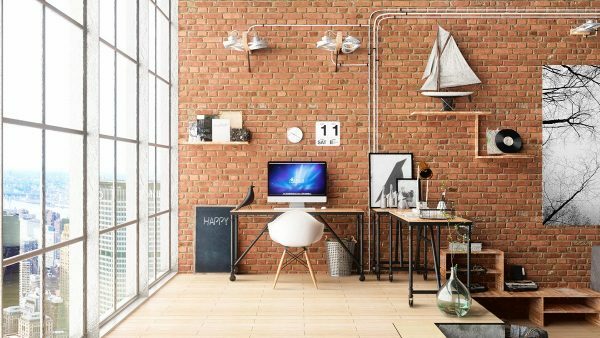 If you’ve already got exposed brick walls or a raw concrete, go with the flow and create an industrial home office. Make use of an unused alcove. 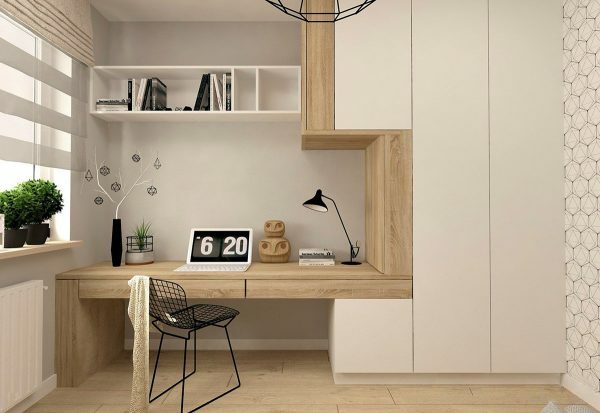 Use custom cuts of timber or MDF to fashion a desk top and shelves inside a small alcove. Bring it out of the shadows with a designer table lamp, like this Menu JWDA lamp. Aligned pendant lights aren’t just for breakfast bars. 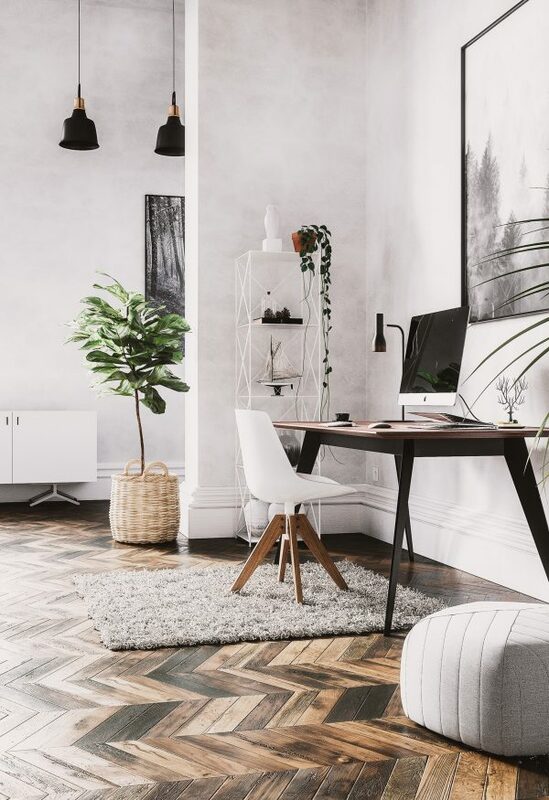 Hang a row of small pendants along the length of your desk to give it some status – as well as ample illumination no matter where you pull in your chair. Don’t forget about the down time. Everyone needs a moment to mull something over during their working day, or even just a moment to rest their back after too long in the chair. Consider including a small sofa or comfortable lounge chair in the layout. Leave room for adjustment. 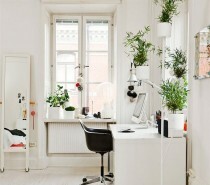 This Scandinavian workspace is built out of an adjustable shelf and storage unit. Put yourself in a spin. If you’re up and down from your desk a lot, choose a swivel chair. It will prevent you from twisting your back – and scraping your floor. 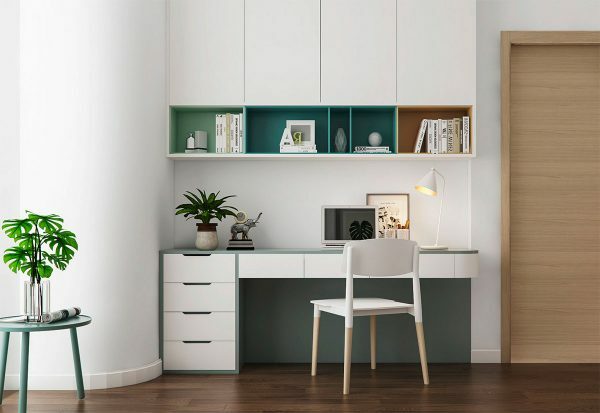 Jazz up a minimalist home office with controlled colour. 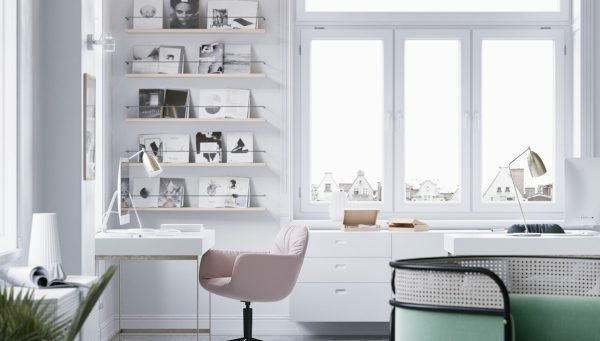 If you like the clean look of an all white home office but need a little colour in your life too, introduce some colourful storage cubbies into the cabinetry. Pep up an existing plain home workspace with a unique desk chair. 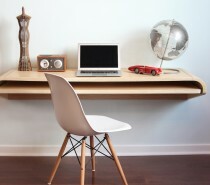 Want your home workspace to meld more with the room? Colour match all office furniture and shelving with the wall paint colour. 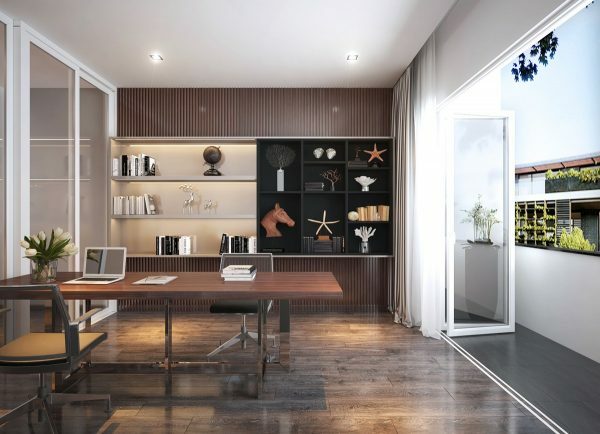 This home office features a stripe of mirror behind the desk to reflect the rest of the room decor too. LED strip lights illuminate the edge of the glass and a Rosendahl monkey. How about a headboard desk? 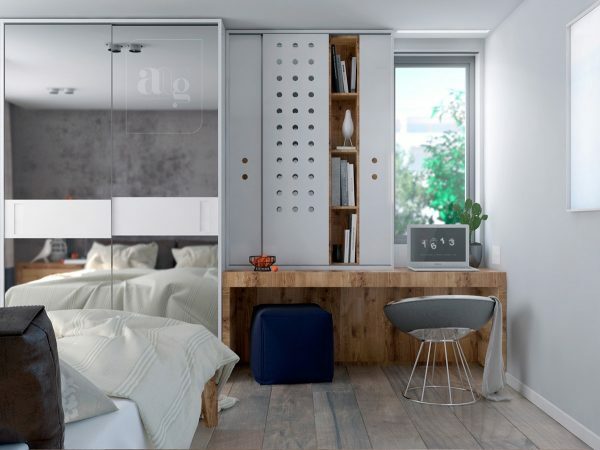 This desktop extends straight out of the bed, with space beneath for a shiny trash can. Another, combo design: this desk build also serves as a tv wall on the back. Got a lot of literature? Get a lot of shelves: Don’t kid yourself when it comes to storage needs, you’ll only wind up with paper mountains on the floor. 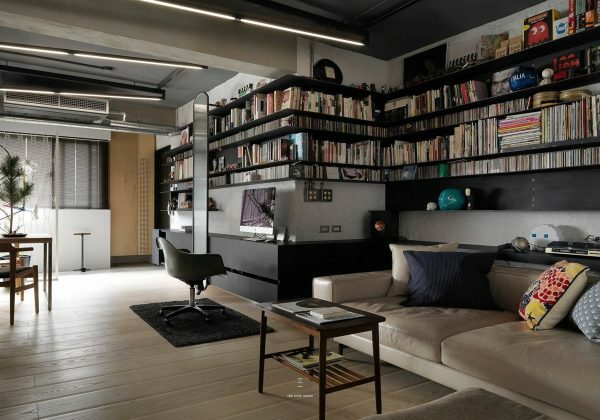 Build bespoke storage up to the rafters, like the sloping cupboards above this neat double workspace. 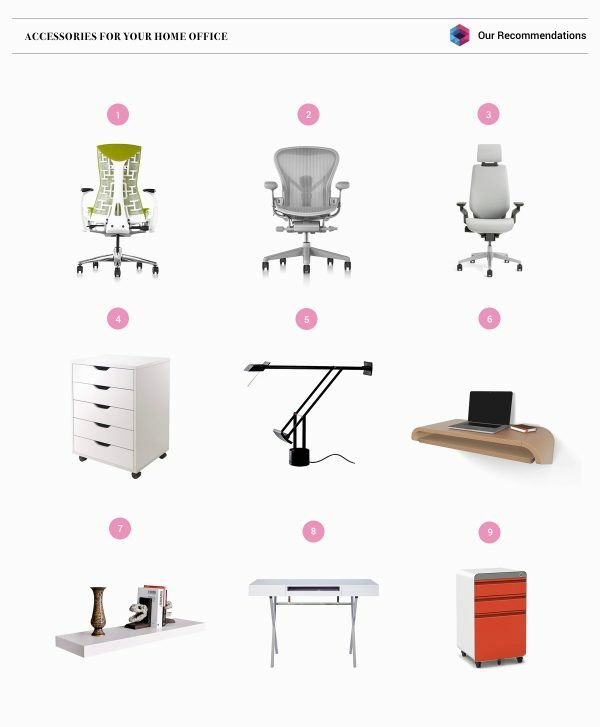 Match office furniture to other pieces in the room. 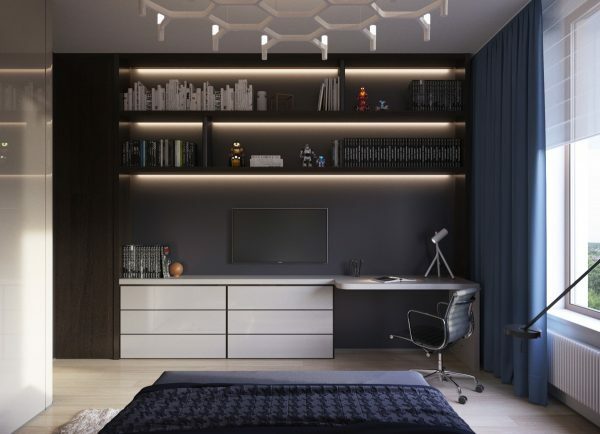 This desk and office storage ties in smoothly with the tv wall decor next to it. Use texture to add interest to a single hued set up. LED strip lights can be used to create ambiance and drama. Bring in greenery to liven up a stagnant scheme. Larger indoor plants can soften the edges of a sharp layout too. Got leftover tongue and groove flooring? Get into the wooden wall groove. 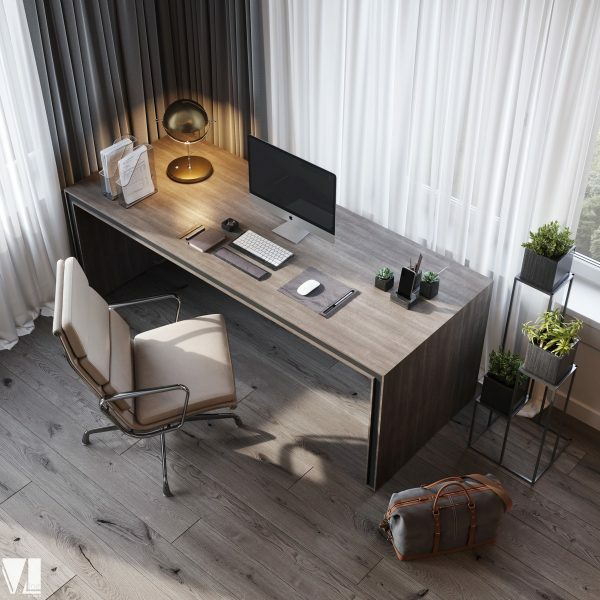 Maximise work area with an L-shaped desk. This curved corner design creates an easy flow around the perimeter of the room. 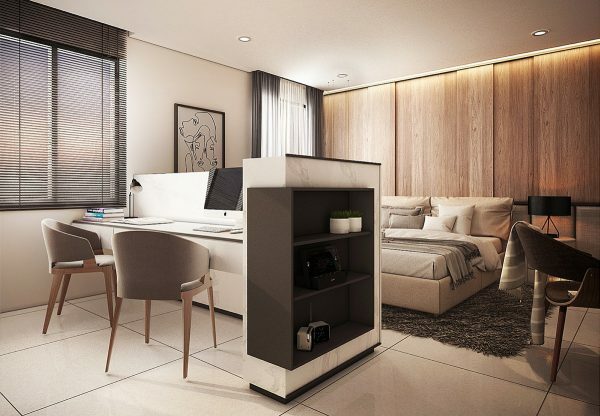 This extended desk design even wraps around a corner, peeping into an adjacent sleep space. Make your creative space POP. 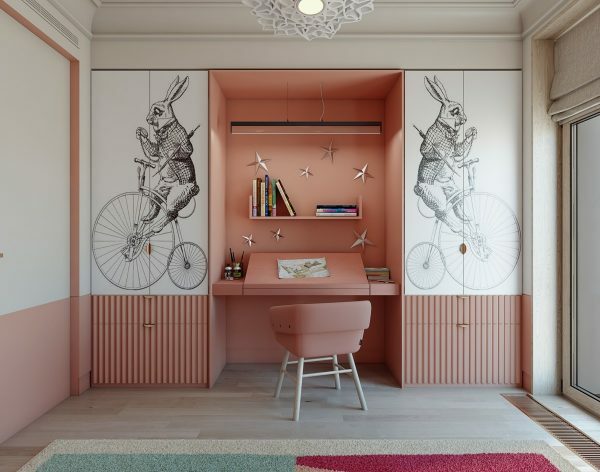 Pop art wall decor and colours combine to make this study area and drawing desk into one inspirational space. Nothing feels quite so inspirational as green spaces. 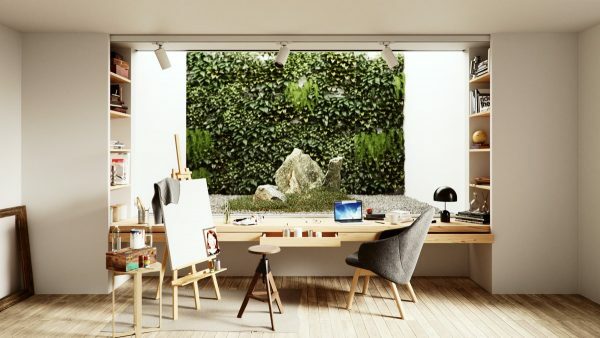 If you can, build your home workspace in front of a window with a garden view, incorporate a courtyard or indoor vertical garden, or even bring in a nature themed wall mural. Add a little whimsy with decals. Create a work ‘block’. This wood cladding covers the wall, ceiling and side shelves of the work area. A couple of indoor plants break up the solid wood tone with a flash of green. Be the same but different! 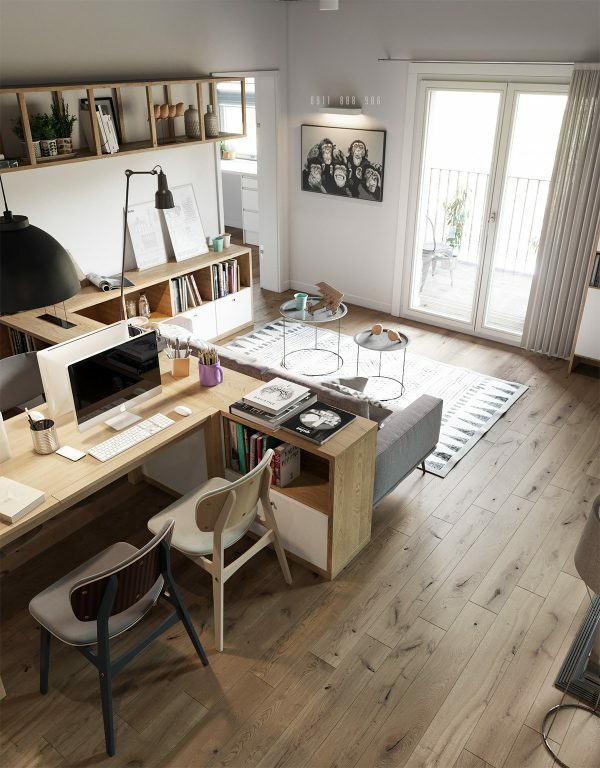 Double workspaces don’t have to be one style fits all. 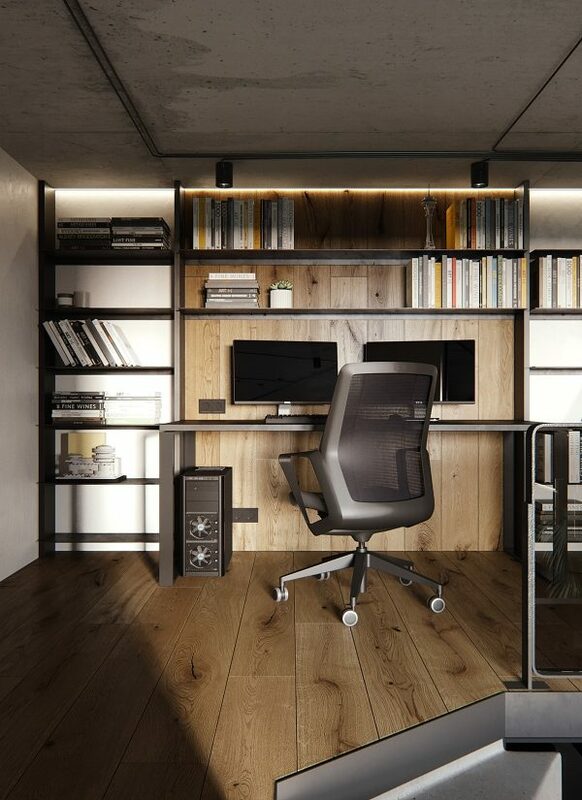 Make each work area suit the individual user by considering different storage needs and preferred lighting levels. … Or a display of treasured items. 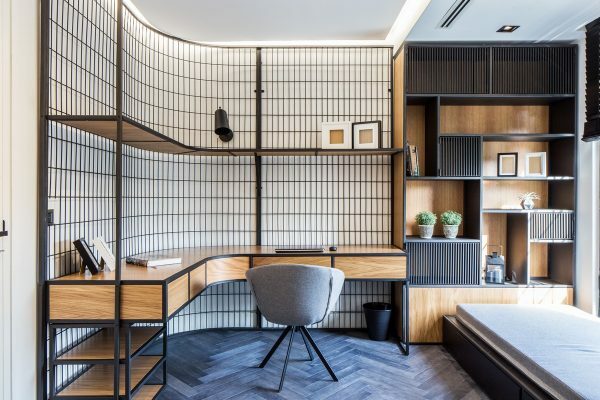 Build up overlapping layers, like this office storage unit, desk and shelving arrangement. Unexpected elements and colour create a fun work environment that you’ll enjoy coming back to. Be inspired by decor through the ages. 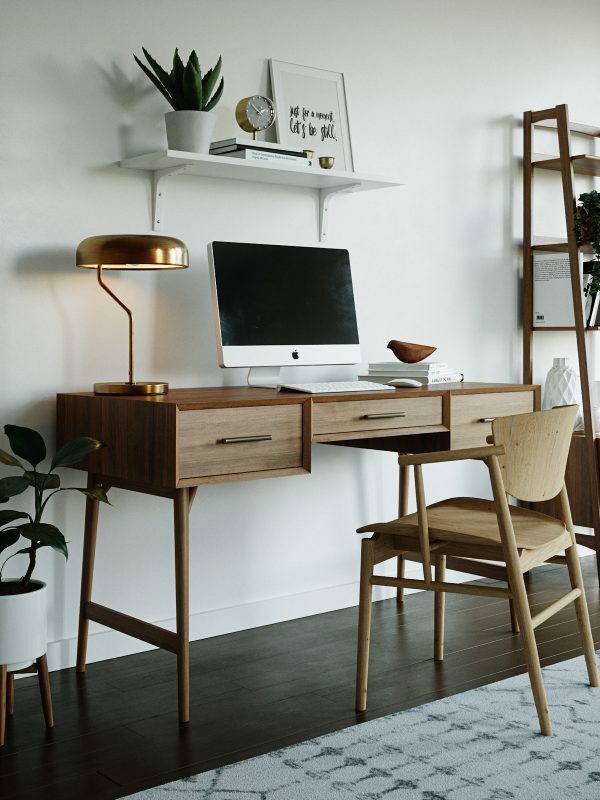 This mid century modern style workspace has a refreshingly quirky kind of sophistication. The mid century modern clock is the Vitra George Nelson Night Clock. An all out traditional decor style evokes a sense of grandeur. 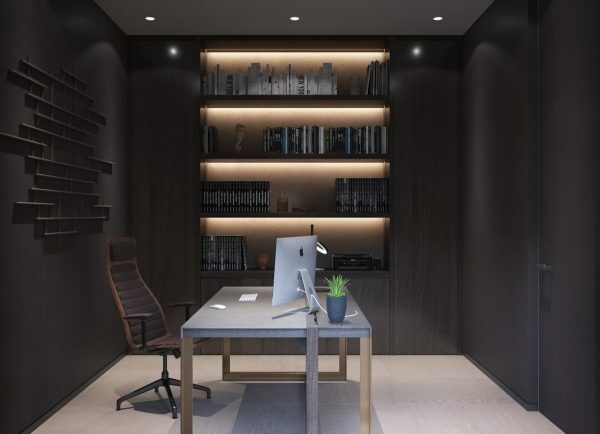 In this traditional home office design, the classic desk is flanked by quaint wall sconces on either side. If there’s not room on the desk for sufficient greenery and its revitalising effects, employ a smart plant stand by the desk. Make room for a friends. 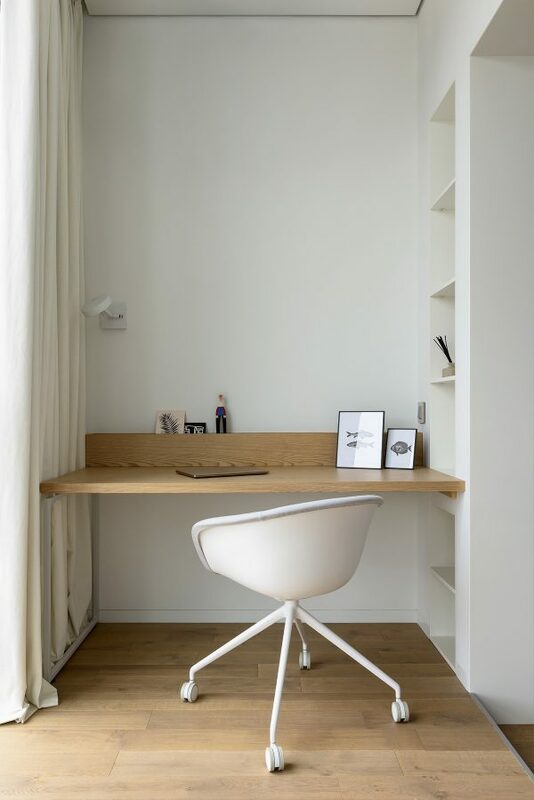 This may be primarily a one person place, but an extra pouf tucked away neatly below the desk top provides a perch for anyone with a helpful idea or two. Think outside the box-shape. Bespoke cabinets can take on any silhouette, from curvaceous to quirky, like this stepped little number. Set the scene. 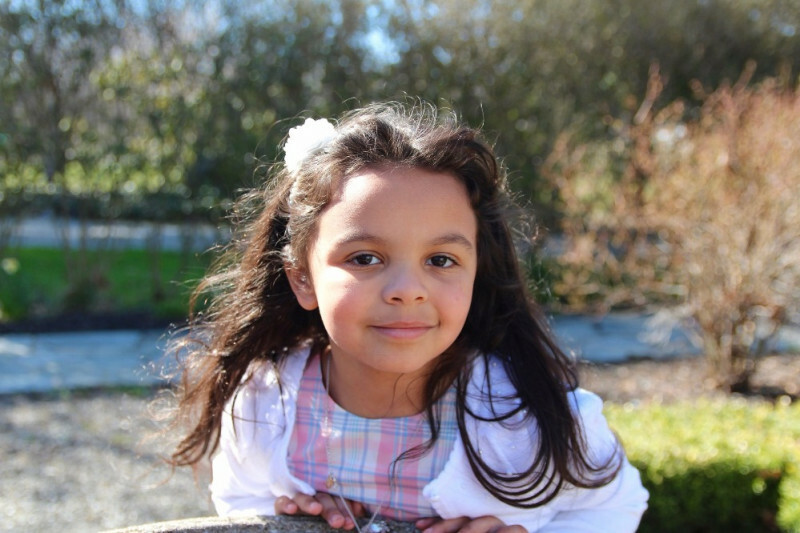 Kids workspaces are pretty essential these days with the amount of homework continually rising. If they’ve got a dedicated, comfortable and attractive area in which to do their work, it may be easier to persuade them to crack those books. Don’t want your study area to be attention grabbing? 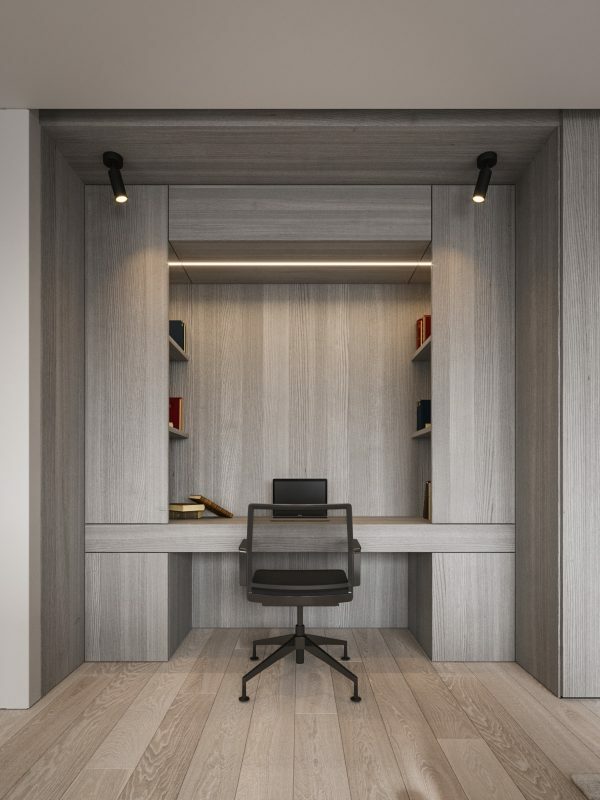 Keep the design minimalist with hidden recessed shelves, a slimline desk and a low backed chair. 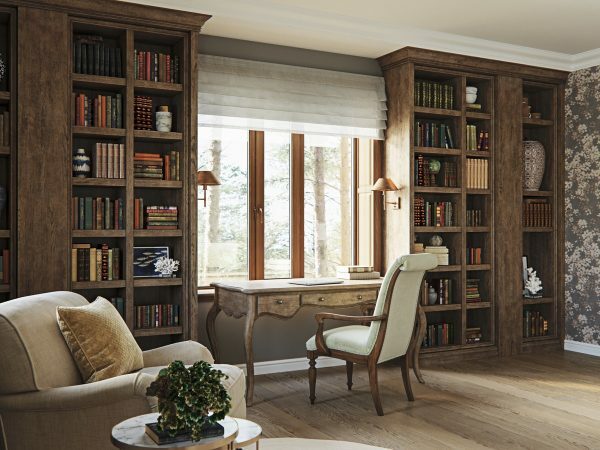 Break up a long expanse of wall with contrasting bookcases, like the two-tone shelving unit in this large home office space. Ditch the sticky notes. Book ledges can be used to hold reference books open at their most inspiring parts. Easily distracted? Keep the location and the decor quiet to aid concentration. Home from home. Office shelving doesn’t have to be all packed out with overstuffed files, paper trays and pen pots. Arrange framed artwork, decorative vases and keepsakes on the shelves in your study to help it feel more like part of the home. Include plenty of lighting. Directional spotlights put the light source right where it’s needed. Castors provide moveable solutions. It’s not just office chairs that cruise on wheels, slide out drawers provide and extra work surface when needed, whilst a pull out PC tower offers easy access to wiring at the back and an easy clean solution. Drape with drama. Whether you’re a big boss or not, you are the boss at home. Design yourself a dramatic room where you can reign supreme.